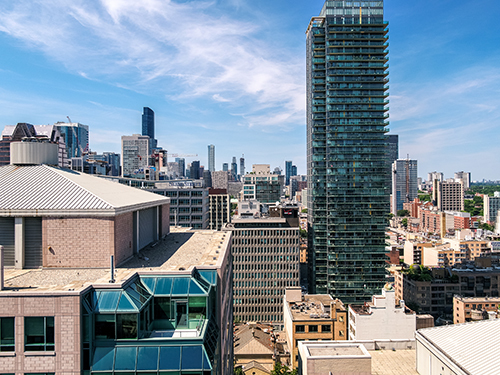 Located in King East's vibrant neighbourhood, 65 King East is just steps to King & Yonge, the Financial Core and less than a 10-minute walk to Union Station with seamless connections to the TTC, Go Transit, Via Rail and the UP Express. This new landmark brings 400,000 sq. 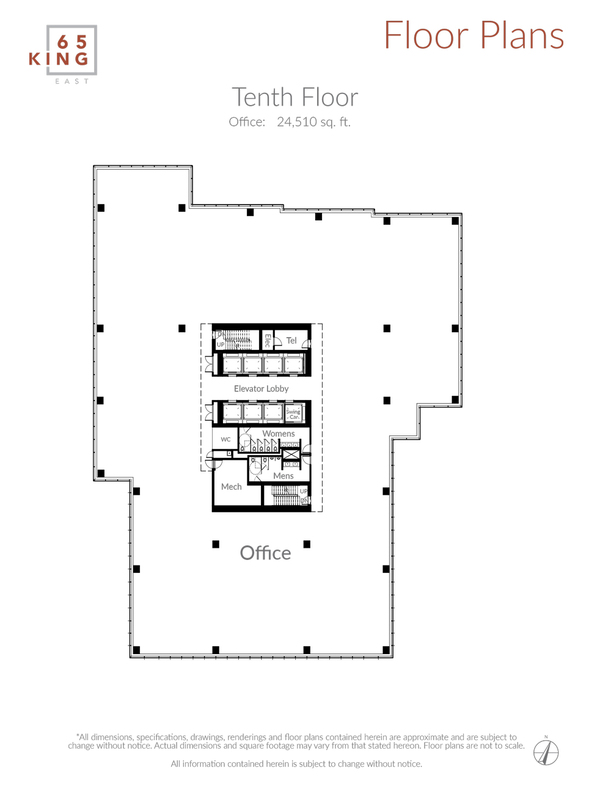 ft. of next-generation workspace to the downtown Toronto core periphery. Generous private terraces span eight floors with expansive views of Lake Ontario, the City of Toronto and the bustling King Street neighbourhood below. Step outside the office and stroll through beautiful St. James Park, lush in greenery and open spaces. 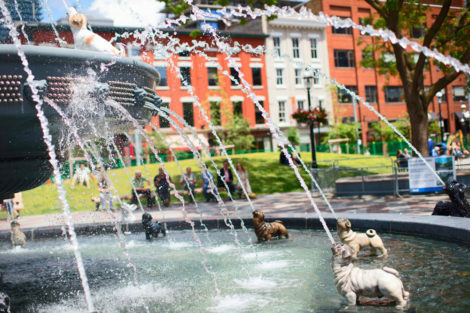 Walk through Berczy Park, home to the Gooderham flatiron building and the famous dog fountain curated by Montreal designer Claude Cormier. The neighbourhood is adorned with stunning architecture, modern design and world-class restaurants, hotels, art galleries, shopping and the historic St. Lawrence Market. Get to meetings or commute from home with ease thanks to quick access to TTC, Union Station and major highways. Park your bike within one of the 174 secured bike stalls and get ready to start your day fresh with the added convenience of in-house amenities, such as locker rooms and shower facilities. 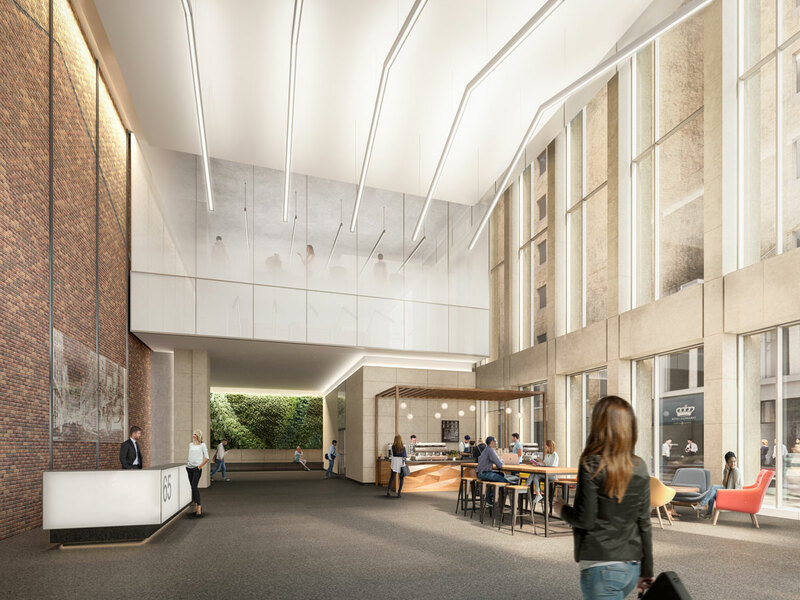 Every detail of 65 King East's next generation workplace environments was designed to create new pathways to foster collaboration, productivity, health and employee wellness. Its terraces offer stunning views of Toronto, Lake Ontario and the energetic King East neighbourhood below. 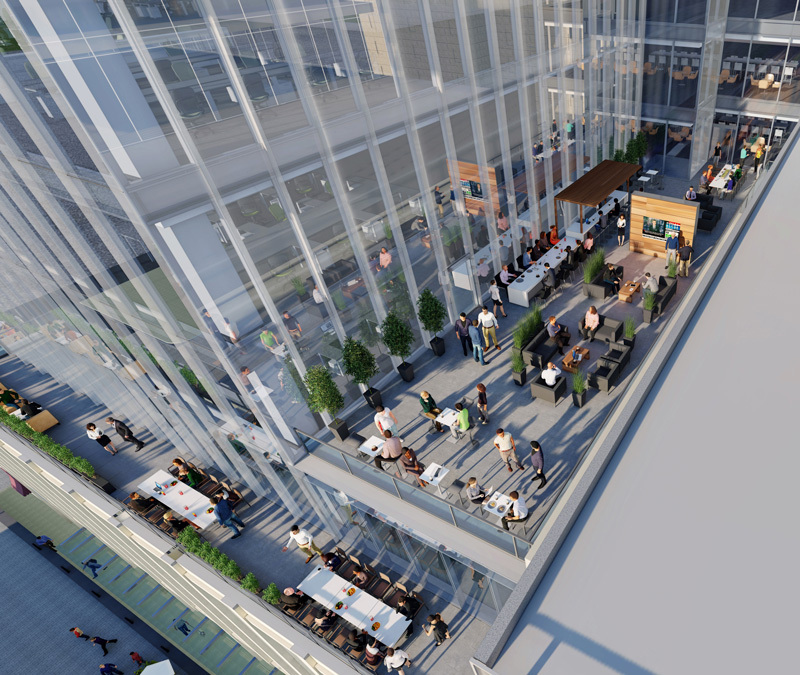 Its next-generation building design sets the foundation for well-being and connectivity, helping you work, live and perform at your highest potential. 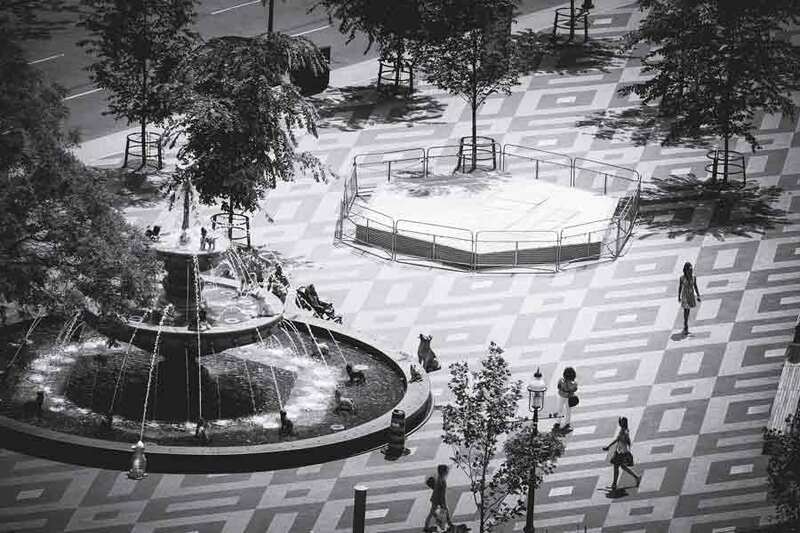 65 King East – Think outside the box. OUTSIDE THE NORM. DESIGNED TO BE DIFFERENT. Think outside - Next-generation office experience should not be confined to the indoors. 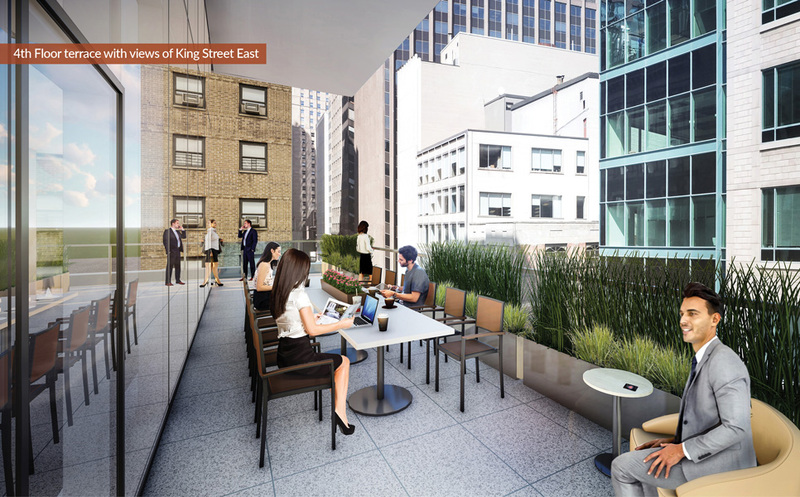 Alongside its terrace workspaces, 65 King East is prominently situated in the energetic King East neighbourhood. 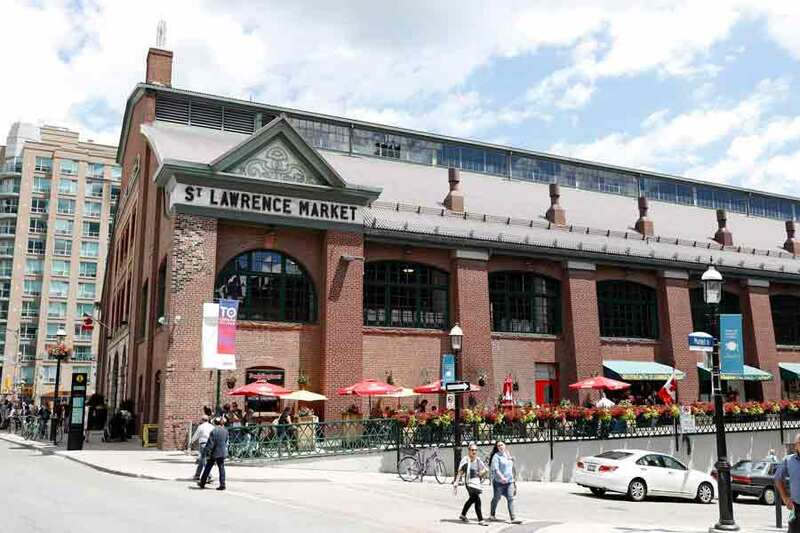 Enjoy lunch or pick up dinner at one of the many different food stalls and shops at the renowned St. Lawrence market, or grab a coffee and stroll through scenic green spaces at St. James Park, Berczy Park and Market Lane park. 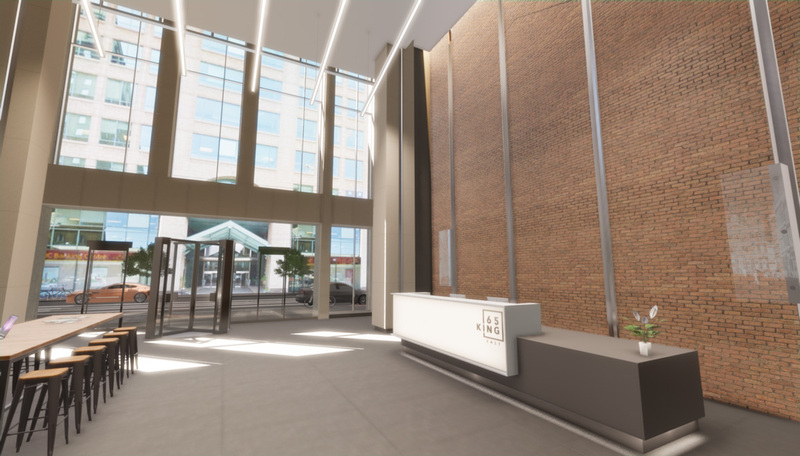 Strategically located on the core periphery, 65 King East offers all the amenities of a traditional office tower in the Financial Core in a vibrant, urban neighbourhood. 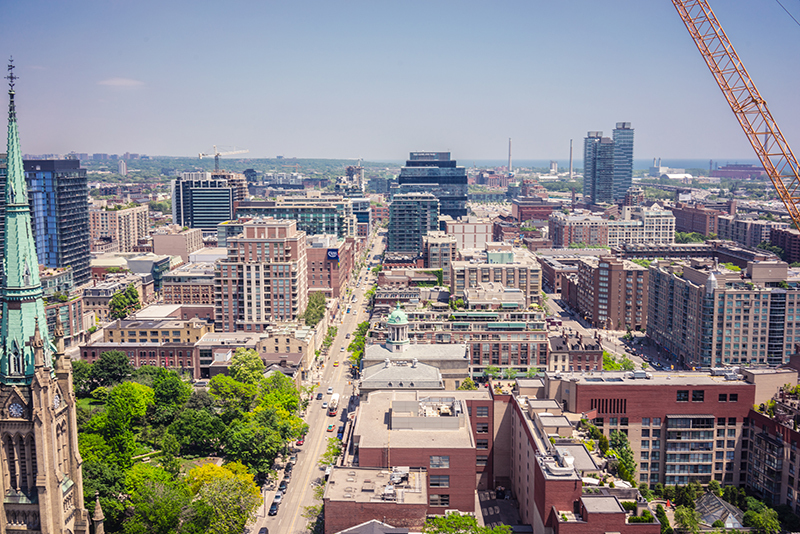 Think connected - With pedestrian-friendly areas, coffee shops and art galleries, King East is a vibrant, urban neighbourhood, while still being connected to the TTC and the rest of Toronto. 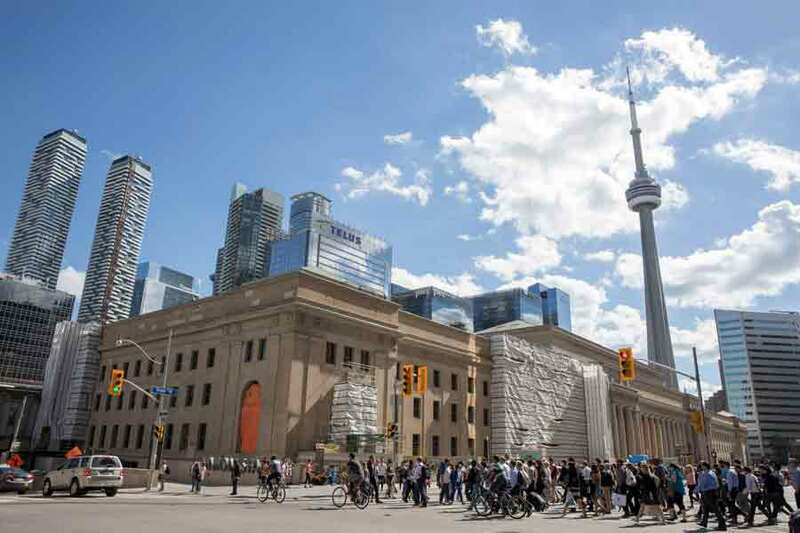 King Subway Station is a mere 2-minute walk, while Union Station, with its smooth transfers to the Pearson International Airport, the GTA and the rest of the city is a just a short 10-minute walk. 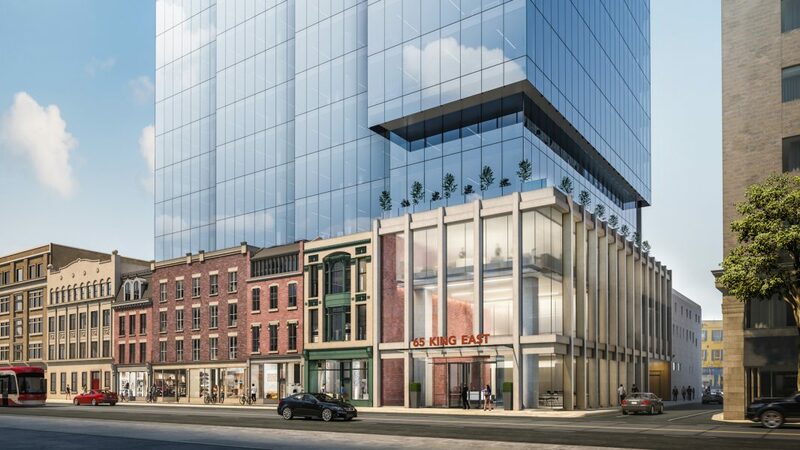 Think revitalization - Boasting a 100/100 walk & transit score, Colborne Lane's revitalization project will enhance the neighbourhood with stylish shops and trendy food options in a pedestrian-focused laneway just outside 65 King East. 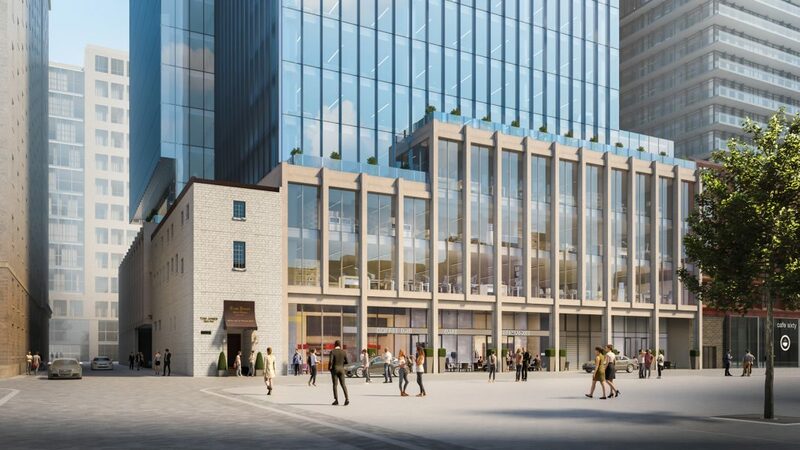 Alongside St. Lawrence Market's own $100M revitalization slated for completion in 2020, these new projects will add fresh and popular retail, food and patio options to an already dynamic neighbourhood. Think Healthy Employees – In-floor HVAC with exposed concrete ceilings provide employees with improved air circulation. Designed for air-flow 3-feet above the floor gives access to better air quality throughout the day reducing absenteeism and promoting employee wellness. Access to views and proper lighting increases employee efficiency levels by approximately 18% compared to a standard office environment. Think Employee Wellness – 65 King East is designed with an aluminum curtain wall system featuring floor-to-ceiling 12' vision glass and double glazed units with low-emissivity, touting grander views of the city of Toronto and Lake Ontario, while flooding the work space with natural light. Studies have shown that access to impactful viewpoints have increased productivity and creativity in employees, while keeping them energized throughout the workday with reduced eyestrain. 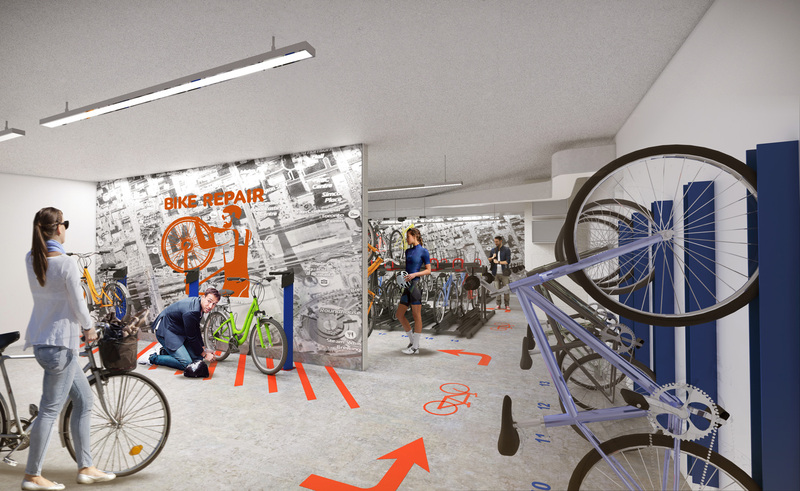 Think a Healthier Commute – Bikers can enjoy an elevated tenant experience at 65 King East with ample bike stalls and modern, clean shower facilities and change rooms. 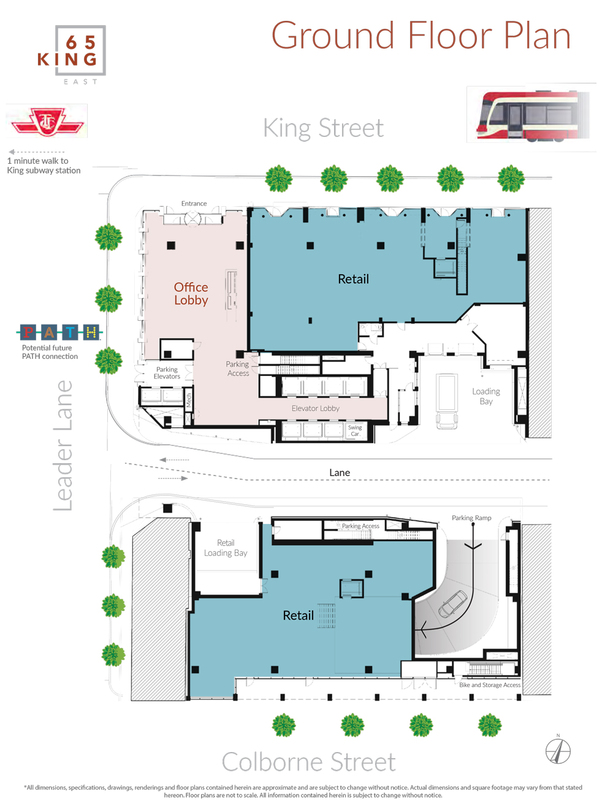 Access to plentiful parking facilities, including EV-Ready stalls for electric vehicles, ensures that getting to and from 65 King East is convenient, fast and effortless. 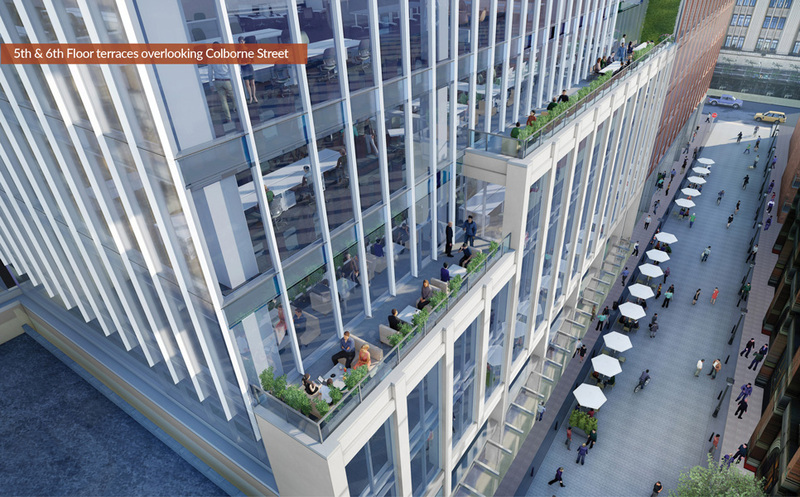 Think Green – 65 King East's building design was centered on green sustainability principles. Every detail, from its floor-to-ceiling windows offering employees stunning views to its green roof and efficient green energy solutions, was curated to enhance tenants well-being. When working in a green building environment, employees reported fewer sick days, improved sleep quality, fewer work-related physical & mental symptoms and a boost in employee satisfaction. Think Overall Wellness – Targeting WELL-ready design to support companies seeking to adopt WELL Building Standards. 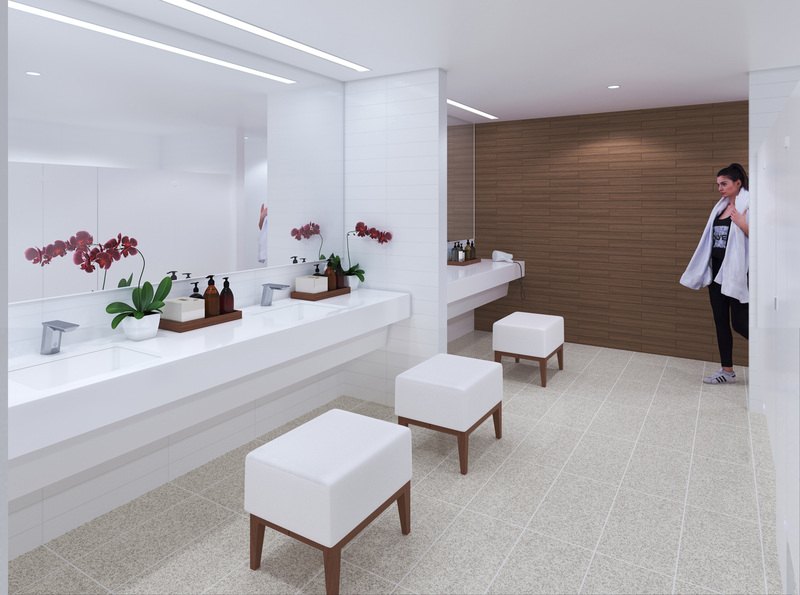 WELL complements 65 King East's focus on health and wellness, by promoting a positive human experience through air, water, nourishment, light, fitness, comfort and mind. RAISING THE BAR ON FORM & FUNCTION. 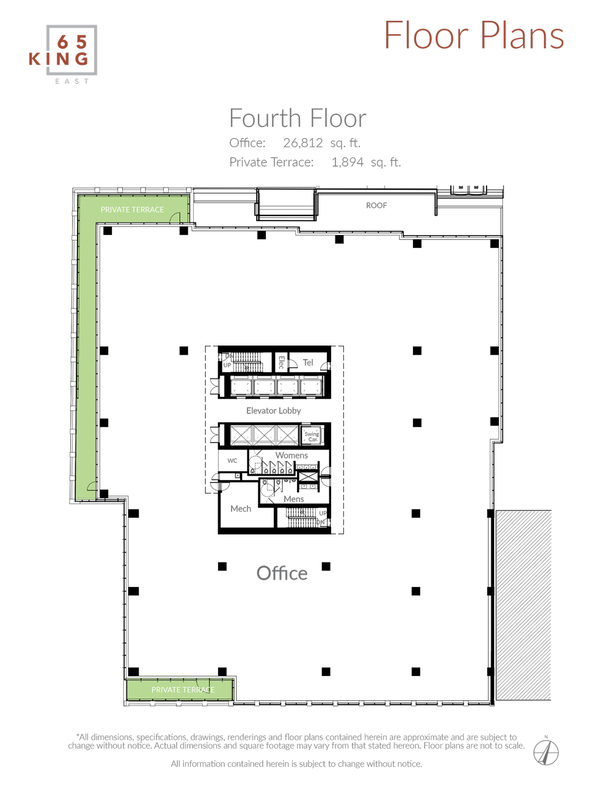 Optimized floor plates offer highly-efficient office layouts, tailor made for collaborative workspaces. In-floor HVAC with exposed concrete ceilings provide employees with improved air quality, while lower gross-up factors lead to greater efficiencies and overall lower costs. 65 King East’s impressively low gross up factor is approximately 14%. Raised flooring allows for greater adaptability, decreasing costs in reconfiguration and relocation. Studies have shown that access to internet is a vital component to job functionality, with 2 out of 5 employees noting that in an internet outage, they would no longer be able to work. 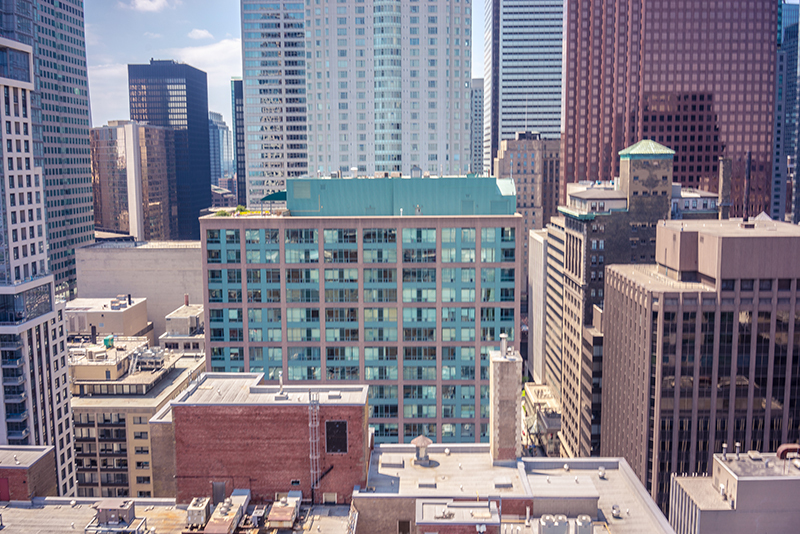 Targeting a Wired Score of Wired Certified Gold, 65 King East’s digital infrastructure ensures that connectivity is promoted, protected and secure. It was developed to enable superior tech capabilities for its tenants through guaranteed fibre connectivity and partnerships with first-class internet service providers. Lighting: high-efficiency, dimmable LED lighting at 400 lux maintained average with integral Daylight occupancy & motion sensors help reduce energy consumption with intelligent technology to dim when not in use and have maximum daylight power when needed. Temperature Distribution: access to internal zones equipped with manually adjustable floor diffusers for increased employee comfort and control. HVAC: providing employees with greater air circulation and flow for access to cleaner, higher quality air throughout the workday. 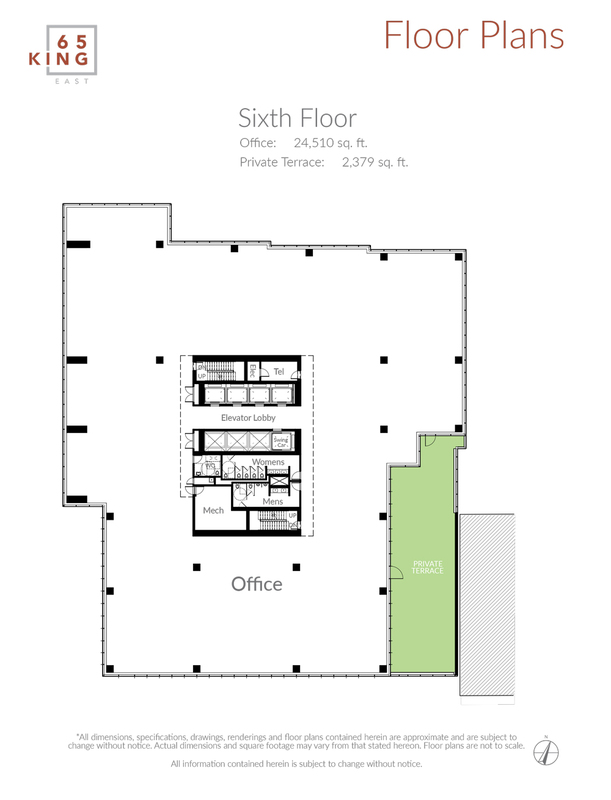 65 King East has dedicated approximately 18,152 sq. ft. for exclusive terrace space over eight floors, ranging from 678 sq. ft. to 4,600 sq. 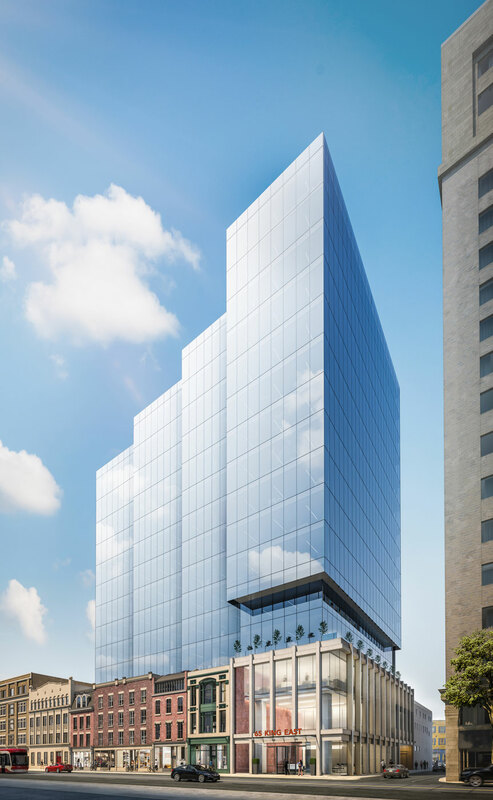 ft. Offering expansive views of the city and the lake, the 65 King East terraces provide companies with a unique opportunity to elevate their employee and client experience, while enhancing their brands. A two-storey mezzanine floods natural light, highlighting 65 King East's distinct historic interior brick wall reflecting the neighbourhood's celebrated architecture. 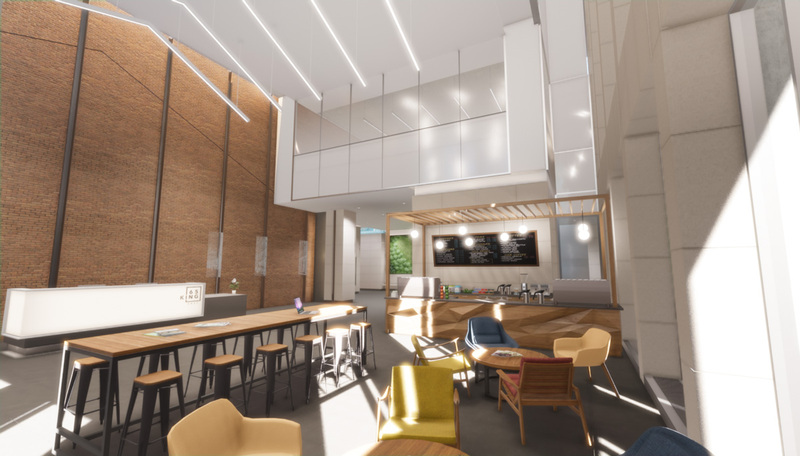 A concierge will help with tenant needs, while ground-floor retail on King Street & Colborne Lane helps promote a creative and collaborative atmosphere. Reflecting contemporary style while honoring the neighbourhood's heritage architecture, 65 King East has preserved four heritage buildings along King Street East while above, private outdoor terraces continue the connection between historic stewardship and newly built form. 65 King East stands apart from traditional box floor plates by offering tenants unique build outs to create and curate their unique brands. 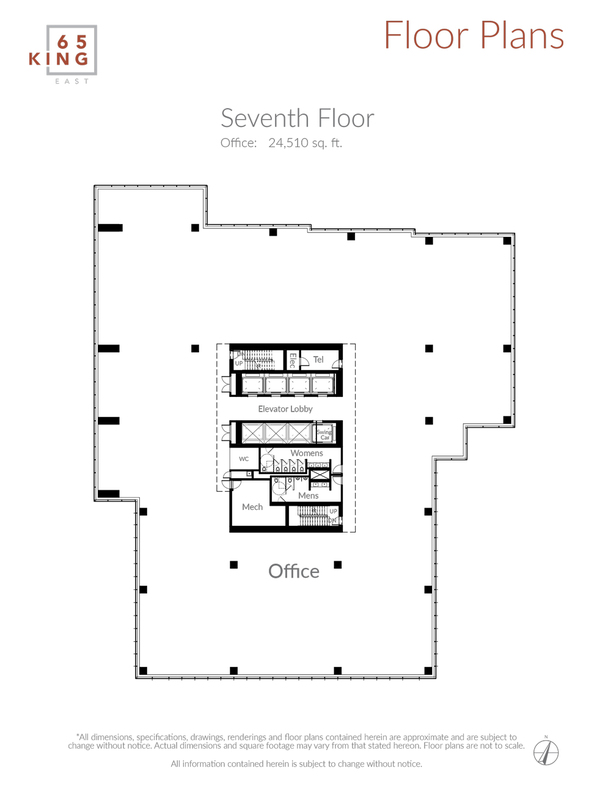 Increased surface glass from 65 King East floor plans allows for more light and additional offices on glass. Highly-efficient mechanical, electrical, elevator and column layouts result in a highly efficient gross up factor of approximately 14% (BOMA 2010). Please select a floor 19th Floor - Terrace: 4,600 sq. 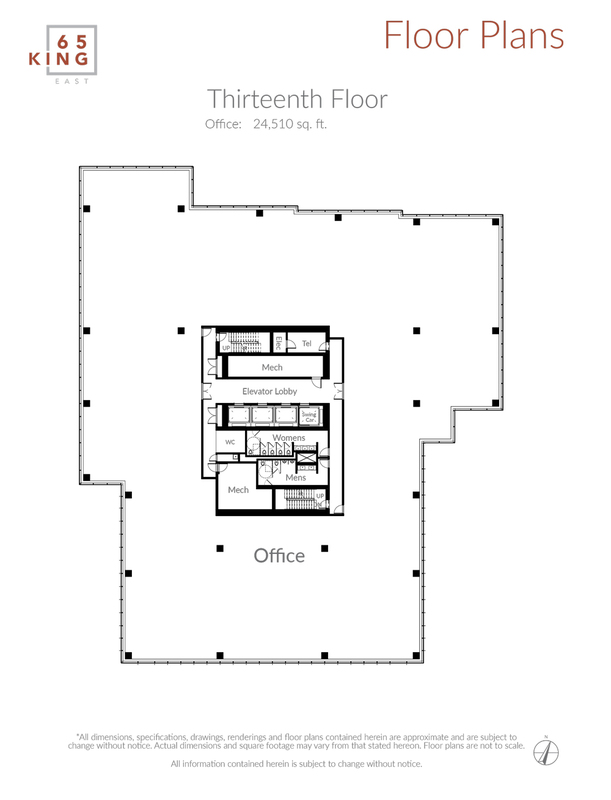 ft. 18th Floor - 15,705 sq. 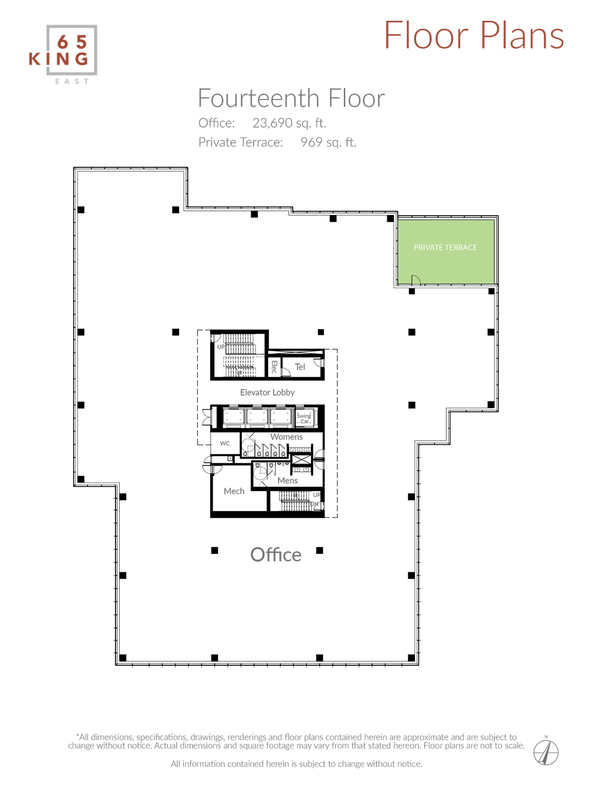 ft. (Access to 19th Floor Terrace) 17th Floor - 15,705 sq. ft. | Terrace: 3,843 sq. 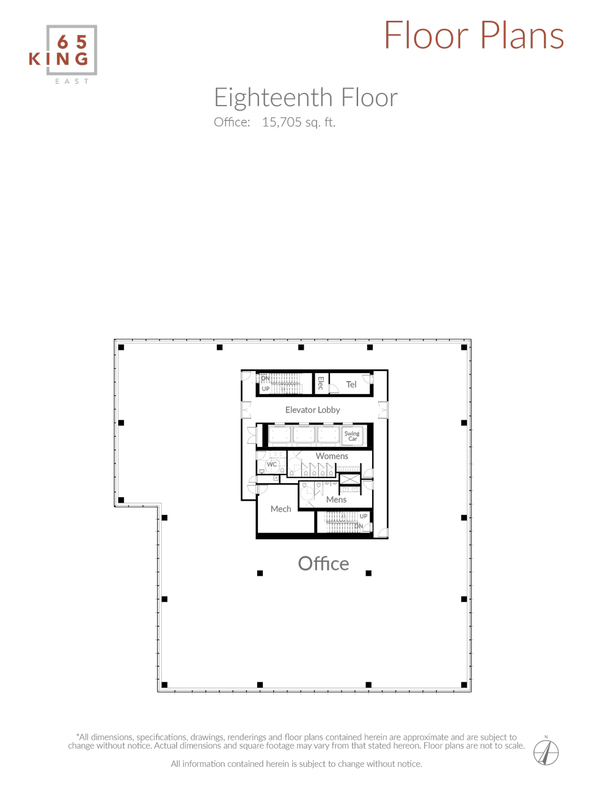 ft. 16th Floor - 19,830 sq. ft. | Terrace: 2,713 sq. 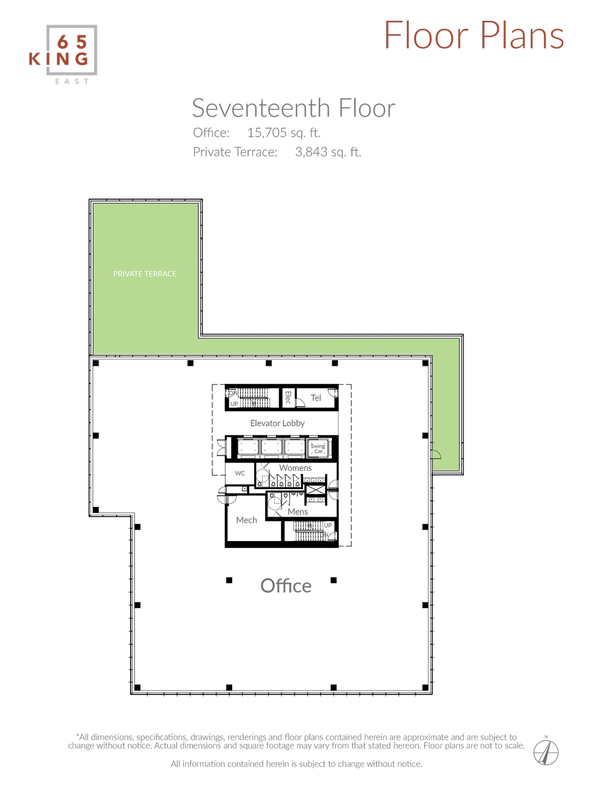 ft. 15th Floor - 22,736 sq. ft. | Terrace: 1,076 sq. 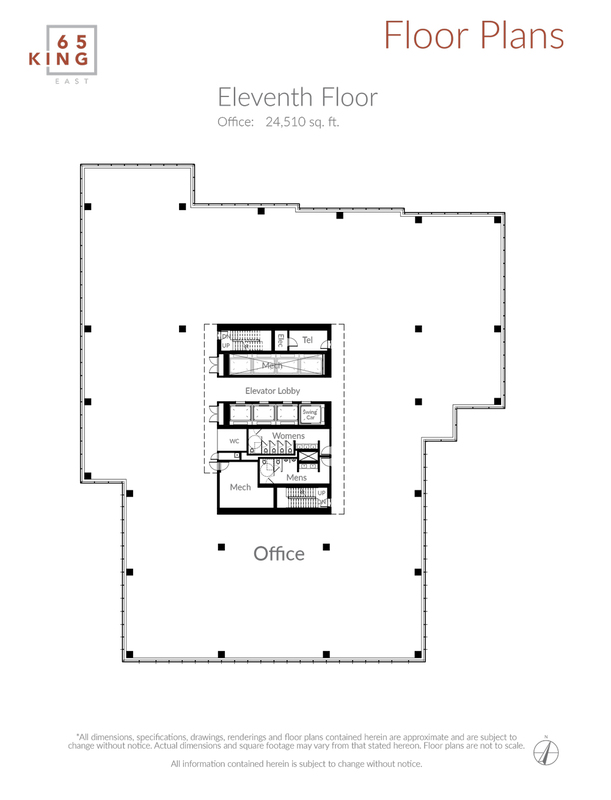 ft. 14th Floor - 23,690 sq. ft. | Terrace: 969 sq. 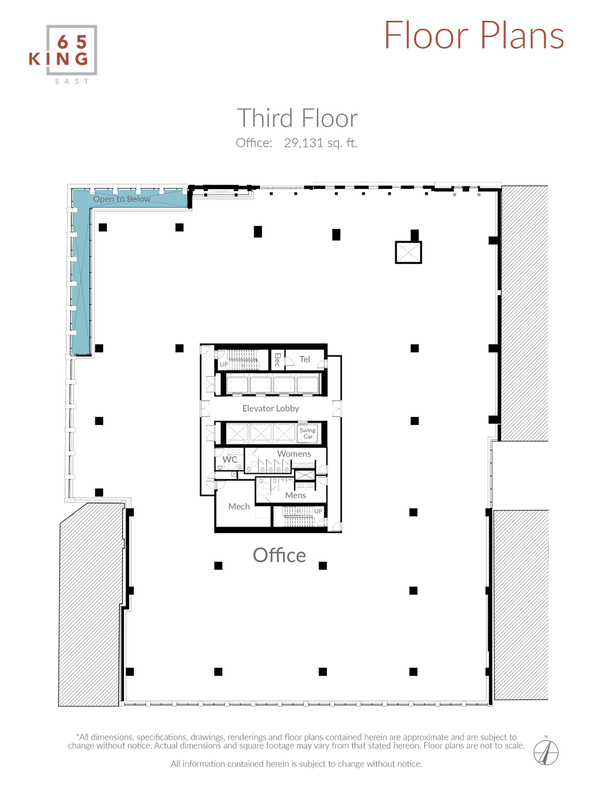 ft. 6th Floor - 24,510 sq. ft. | Terrace: 2,379 sq. 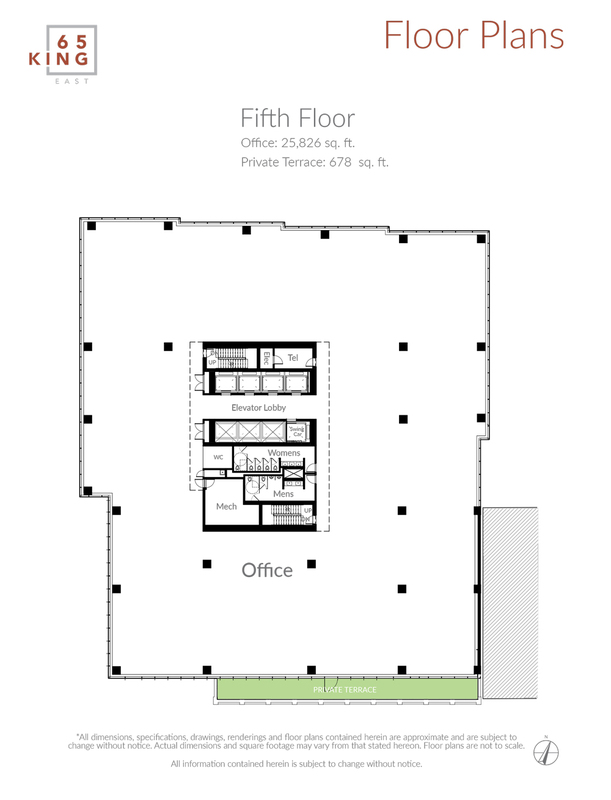 ft. 5th Floor - 25,826 sq. ft. | Terrace: 678 sq. 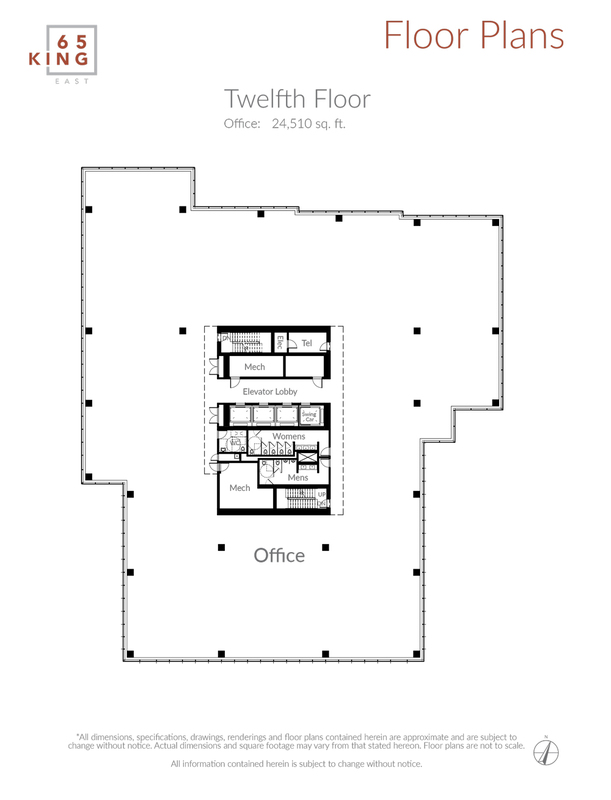 ft. 4th Floor - 26,812 sq. ft. | Terrace: 1,894 sq. 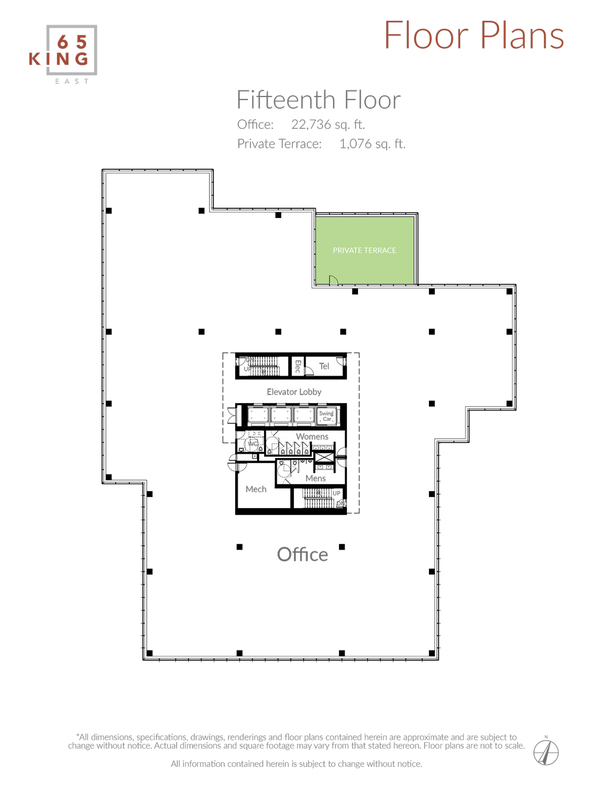 ft.
15,705 sq. ft. | Terrace: 3,843 sq. 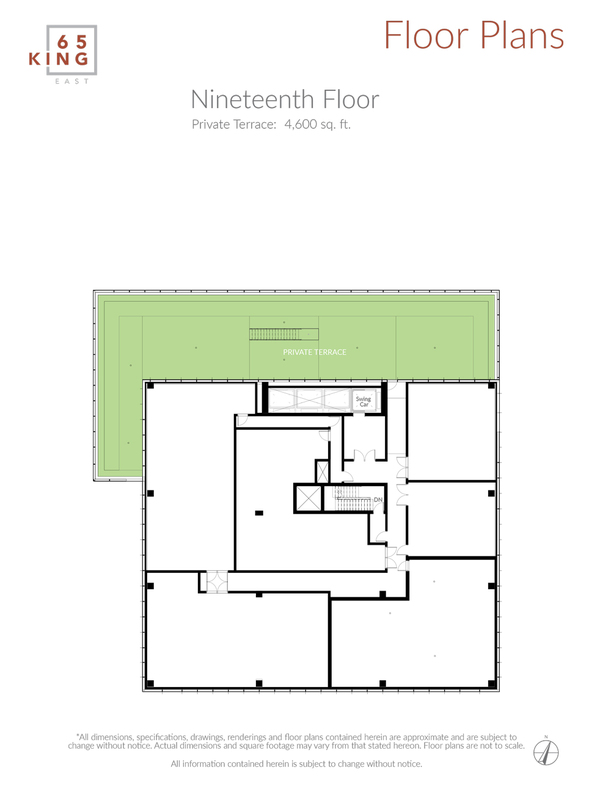 ft.
19,830 sq. ft. | Terrace: 2,713 sq. ft.
22,736 sq. ft. | Terrace: 1,076 sq. ft.
23,690 sq. ft. | Terrace: 969 sq. ft.
24,510 sq. ft. | Terrace: 2,379 sq. ft.
25,826 sq. ft. | Terrace: 678 sq. ft.
26,812 sq. ft. | Terrace: 1,894 sq. 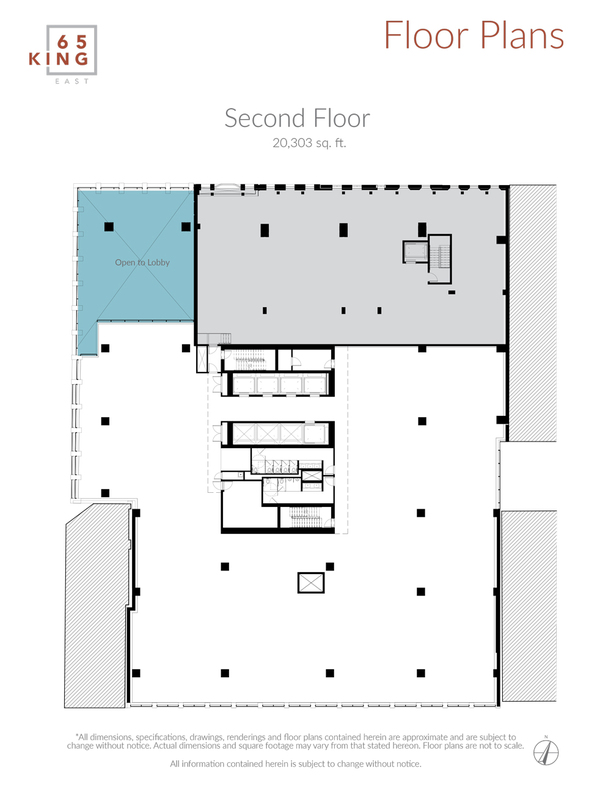 ft.
Visualizing a built-out space, even with the help of plans and renderings, can be a challenge. Floored Plans can quickly and seamlessly create, customize and share test-fits, while providing real-time visibility into key decision metrics, including headcount and open space. 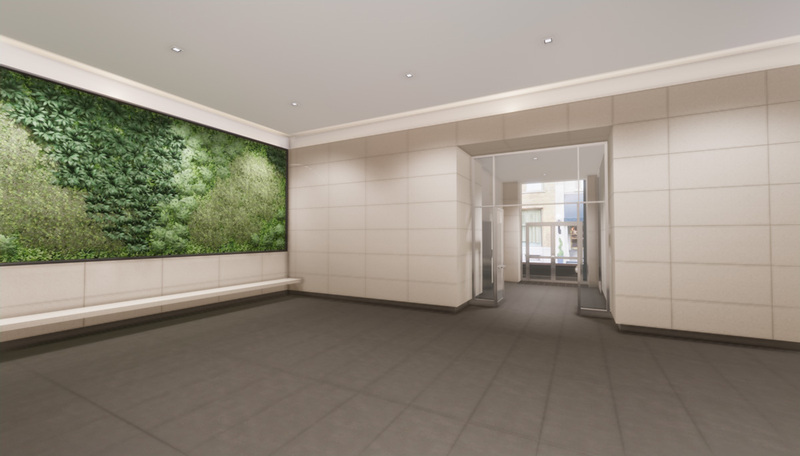 With a simple click, test-fits are transformed into 3D immersive experiences, complete with accurate panoramic views and customizable configurations to help tenants' visualize their new offices and views. 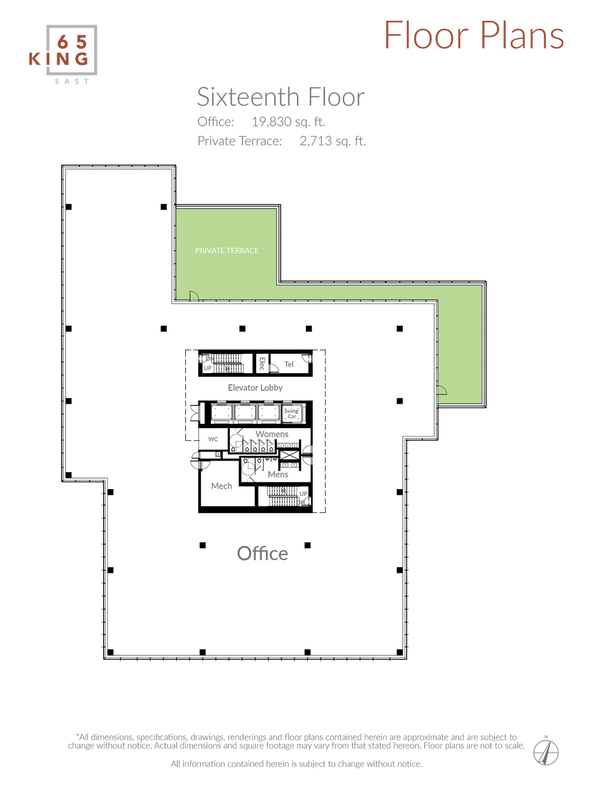 Floored creates cutting-edge software that communicates your vision and brings your spaces to life. 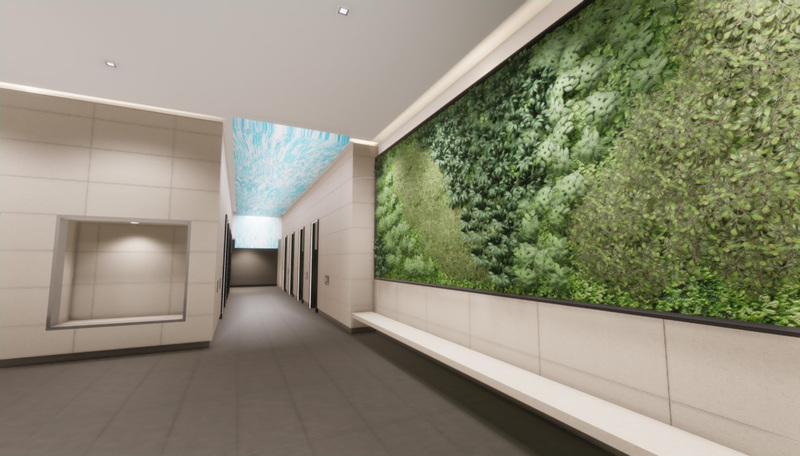 Explore your new bespoke office freely with immersive, interactive web-based 3D environments helping you to build your office and brand to its greatest potential. Watch your brand come to life with the help of Floored, and see its endless potential in curating your own next generation work space. Want to see how your brand fits at 65 King East? Outside the core. The best of Toronto. Carttera is a Canadian real estate investment fund manager, blending institutional capital with entrepreneurial agility. Established in 2005, Carttera's development team is led by highly experienced principals, each with over 30 years of industry experience, including acquisition, development, re-development, construction, finance, operations, leasing and asset management. 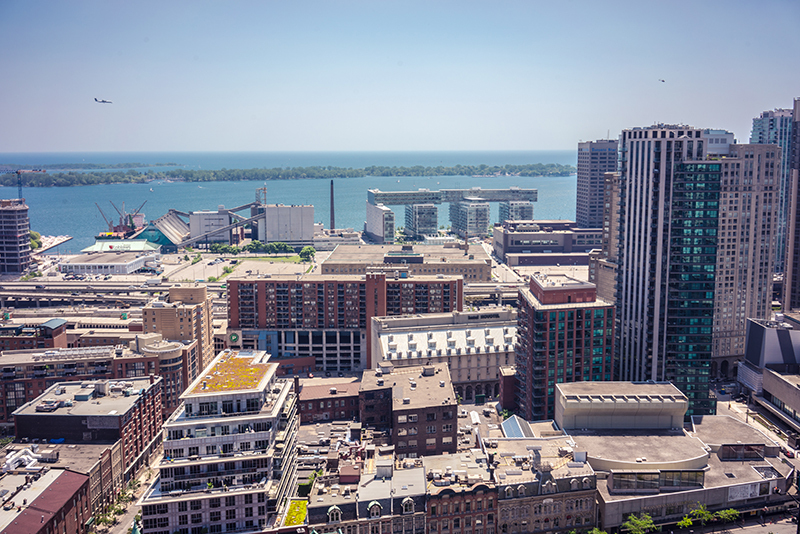 The firm invests its capital in innovative urban intensification projects, and is a leader in environmental sustainability in the Canadian development industry. Carttera's strength lies in its track record of success in originating, structuring and executing investments in an industry characterized by high barriers to entry and success. Carttera currently has Canadian development projects totalling in excess of $2.4 billion, with their primary holdings concentrated in the GTA and Montreal. 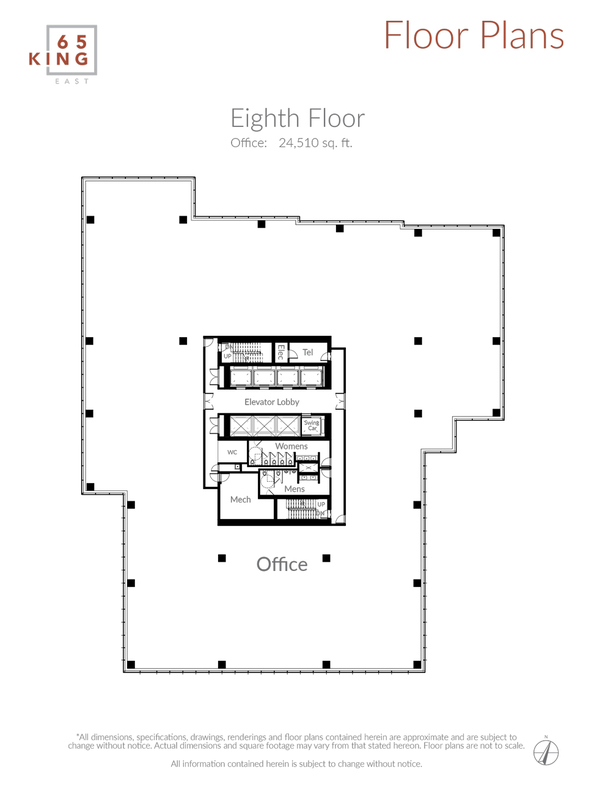 The firm's projects include a wide variety of product types, including office, mixed-use, industrial and condominiums. WZMH Architects is an award-winning architectural partnership established in 1961 in Toronto, Ontario. Since its inception, WZMH has built a reputation on innovative design, technical expertise and dynamic leadership. The firm's expertise encompasses all aspects of the architectural process from master planning, site evaluation and feasibility studies, through the design and construction documentation phases, to the final selection of finishes and fittings for building interiors. The firm's experience spans significant institutional and corporate projects, courthouse design, hotel and conference facilities, data centres, retail and office developments, resort and entertainment complexes, educational and residential buildings, as well as a number of major master plan studies. Project locations range from dense urban downtown sites to suburban, stand-alone facilities. All of these projects included diverse client and user groups with complex programming and technical requirements. In recent years, the firm has incorporated sustainable principles into the majority of its projects and has received numerous domestic and international LEED awards. Founded in 1926, Page+Steele Architects is an international ﬁrm, recognized for design excellence. The ﬁrm recently merged with IBI Group and is now known as IBI Group Architects. IBI is a recognized leader in commercial, residential, hospitality, retail and mixed-use design. IBI currently has 2.1 million s.f. 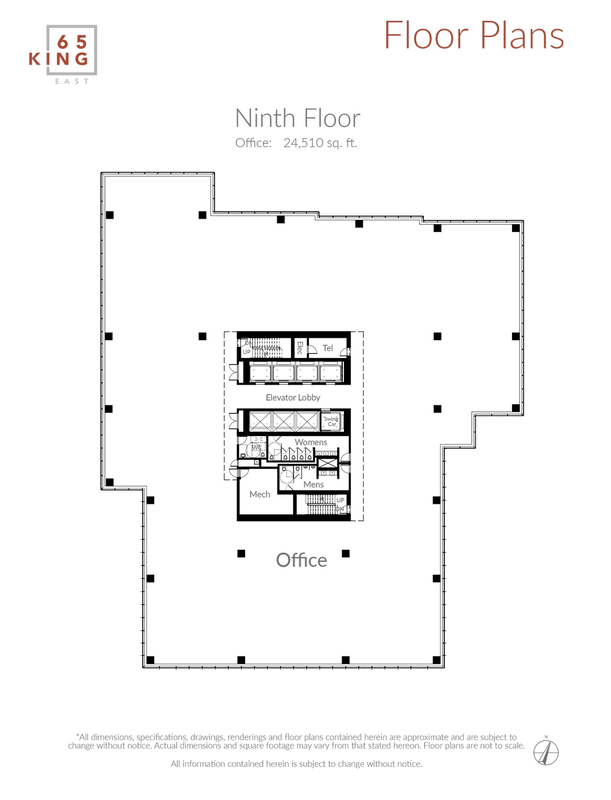 of office space in design and construction across North America. Working with Carttera, IBI recently completed L'Avenue, a mixed-use project in Montreal, that incorporates 100,000 s.f. of office space occupied by 'We Work' in its first Canadian location. The project was the recipient of the INOVA award from the Urban Development Institute of Quebec for its "intelligent urban densification". IBI is currently designing office buildings in major cities across Canada, United States, and India. CBRE Group, Inc. (NYSE:CBG), a Fortune 500 and S&P 500 company headquartered in Los Angeles, is the world's largest commercial real estate services and investment firm (based on 2017 revenue). 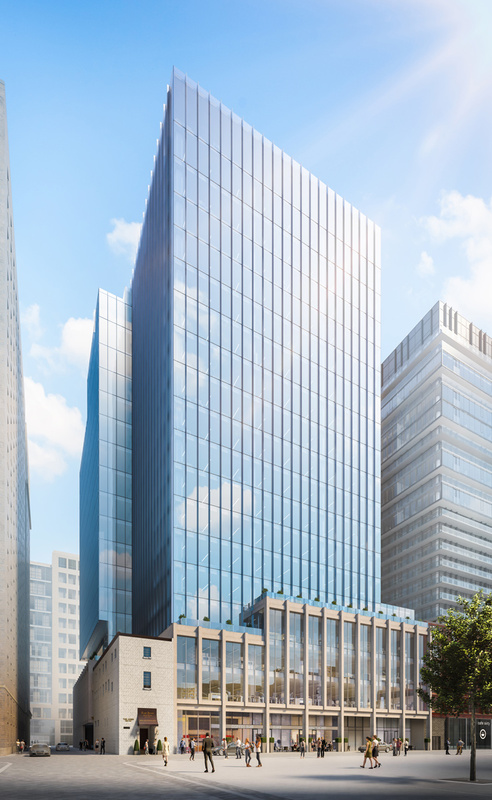 The company has more than 80,000 employees (excluding affiliates), and serves real estate investors and occupiers through approximately 450 offices (excluding affiliates) worldwide. CBRE offers a broad range of integrated services, including facilities, transaction and project management; property management; investment management; appraisal and valuation; property leasing; strategic consulting; property sales; mortgage services and development services. Please visit our website at www.cbre.com. PCL is a group of independent construction companies that carries out work across Canada, the United States, the Caribbean, and in Australia. These diverse operations in infrastructure, heavy industrial, and buildings markets are supported by a strategic presence in 31 major centres. Backed by PCL's 111-year legacy, and with more than four decades of experience in Southwestern Ontario's dynamic construction market, the Toronto office is PCL's largest district with more than 550 of the construction industry's most-talented professionals and an annual construction volume of more than $1.0 billion. For more information, visit: PCL.com/Toronto. Founded in 2011, Entuitive is a consulting engineering practice with a vision of bringing together engineering and intuition to enhance building performance. Backed by decades of experience, Entuitive is taking design performance to new heights through collaboration with clients in North America and internationally including municipalities, architects, developers, building owners and managers and construction professionals. With more than 190 staff members in seven offices across Canada (Toronto, Vancouver, Calgary and Edmonton), USA (New York) and the United Kingdom (London and Edinburgh), our practice encompasses structural, building envelope, restoration, and special projects and renovations consulting. We earn our reputation by applying our ingenuity and use of leading-edge technology, including BIM, in a wide variety of sectors, including: institutional, commercial, sports and recreation, cultural, residential, retail, healthcare, transportation and hospitality. It's our collective ability to simplify the complex that makes us who we are. We are Entuitive. Soberman Engineering is a consulting firm specializing in elevators and escalators. It's founder, Jonathan Soberman, has over 20 years of experience in the elevator industry. Soberman Engineering's areas of expertise include elevators, escalators, moving walkways, handicap lifts, and dumbwaiters. The firm is familiar with the design criteria and ongoing needs specific to commercial, residential, and institutional properties, and has been the elevator consultant on numerous high-rise office developments in downtown Toronto. 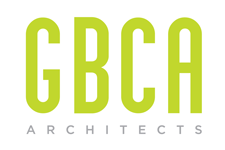 GBCA (Goldsmith Borgal & Company Ltd. Architects) provides a full range of architectural services to clients for a variety of built projects including adaptive reuse, restoration, and rehabilitation. Working as prime consultant or as part of a larger team, GBCA brings together the skills, sensitivity, specialized knowledge and commitment to undertake technically demanding work that not only conserves our built and cultural heritage but also creates contemporary environments that support our clients' needs and aspirations. GBCA is one of the leading heritage firms providing consultancy services for projects across the country. Services include the preparation of heritage impact assessments, conservation reports, master plans and feasibility studies, as-found documentation, and construction drawings. Led by the Principal of the firm, Christopher Borgal, GBCA consists of five associates, all of whom bring to the firm distinctive specialties in the heritage, conservation and design field. Supported by our team of architectural and administration staff, we are committed to responding to the needs of our clients energetically and proactively. Years of successful, award-winning projects and satisfied clients are a testament to our dedicated staff. Smith + Andersen is a trusted Canadian consulting engineering firm with offices in Toronto, Vancouver, Calgary, Edmonton, Winnipeg, London, Ottawa, and Halifax. 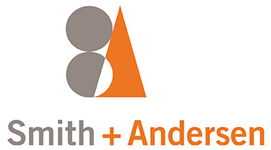 Founded in 1965, Smith + Andersen has organically grown from an established reputation as trusted mechanical and electrical consultants, reaching new levels of engineering and design excellence in the communications, security, and audiovisual fields, and providing enhanced services such as lighting, building automation systems, and intelligent integrated systems design. Thanks to a client-focused approach, the Smith + Andersen team is consistently called upon to apply efficient, sustainable, and reliable design and engineering solutions on the most exciting projects across Canada. Smith + Andersen has consulted on new and existing office developments across the country, including EY Tower in Toronto, Manulife Tower in Calgary, and Edmonton ICE District office tower. 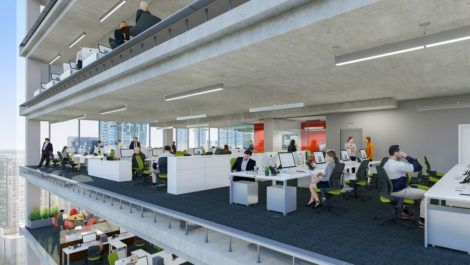 In addition to an impressive base building office portfolio, the firm has worked with collaborative design teams to deliver innovative tenant spaces, including Toronto workplaces for KPMG, Coca-Cola Canada, and Scotiabank Digital Factory. Ecovert is sustainability consulting company specializing in LEED, WELL and Net Zero Carbon building certification programs. Our team of passionate,highly skilled individuals work together to deliver big picture solutions which enable our client to move forward with confidence. Areas of expertise include Energy Modelling, Measurement & Verification Planning, Daylighting Simulations, Building Systems Commissioning and Energy Audits. The Sandbox Project seeks to bring leading individuals and organizations together to ensure that all children in Canada get all the support and care they need to become healthy, active, well-adjusted and contributing adults in our society.